Ethan Poe, 16 and gay, is struggling to maintain balance in his increasingly chaotic life. His parents are divorcing, his brother Kyle is damaging his own right hand in the name of purity, and his best friend, who is extremely religious, prays for Ethan to be straight. As Ethan begins seeing the light in the form of Max Modine, a boy he wants to know better, his rural Maine town is exploding around him. Against his intentions he gets pulled into a pitched and sometimes violent conflict about whether Intelligent Design should be introduced into science classrooms. Friendships end, families are torn apart, and the school becomes a battleground. It isn’t long before Ethan must decide how far he is willing to go to protect what he believes. 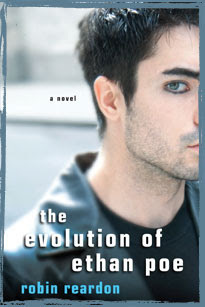 Add your review of "The Evolution of Ethan Poe" in comments!